Somewhere around fourth grade was the first time the concept of heritage or even that individual family members come from different places was introduced to me. After that my friends and I would talk about “What we are” and compare our bloodlines. At our lunch table in the cafeteria at Holy Ghost Catholic School, in our little plaid Catholic school uniforms, each one would interject “I’m 30% Irish and 70% Italian” or “I’m 40% German, 20% English, and 40% French.” It was like a competition of who had the coolest lineage. “Cool” at this time to my peers in Hammond, Louisiana was basically equivalent to sameness. Everyone wanted to have the same heritage as the kid sitting next to them. I was always hearing different things about where my family was from, but I wasn’t sure that my family history shared much with the kid on my left. 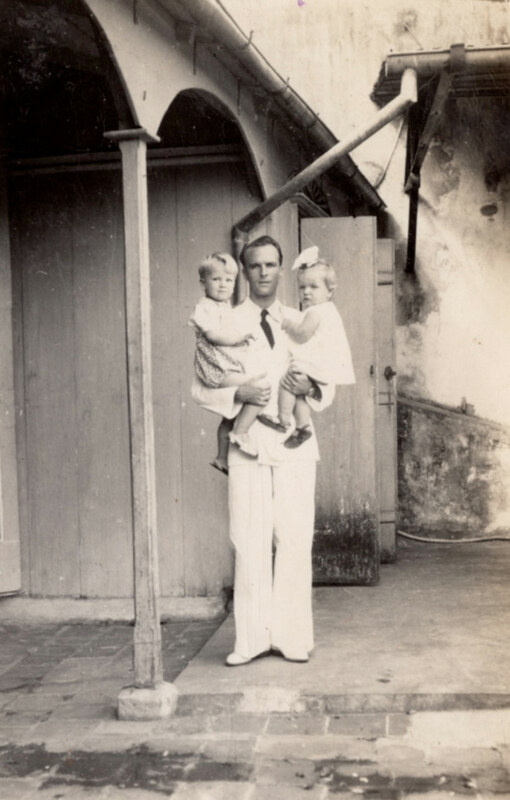 Jack holding Drew’s great-aunt and uncle, Denyse and Ray, on the terrace of their home in Pointe-a-Pitre, Guadeloupe in the late 1940s. Photograph courtesy of the Kinchen family. My last name, Kinchen, comes from my father’s family. We’ve looked up the origin of the name and it has come up as Irish, Scottish, and German, but overall my father’s ancestry is questionable. My grandmother once told my sister, Rhys, and I that our family was related to Benjamin Franklin, and we thought that was the coolest thing in the world. As I got older and learned a little more about that family, the more I realized that not only was that incredibly false, but that there was no way in hell these people were descendants of the man who discovered electricity and was essentially a founding father of this country. Regardless of their connection to the man on the hundred-dollar bill, they really stopped being present in my life at a young age. As for my mom’s paternal side, they are very much Italian and Irish. In their early years in New Orleans, my mom’s grandfather lied about being Irish because they were looked down upon and told everyone that they were Dutch instead. Growing up, I fought my cousin because she desperately wanted to believe that we were Dutch, but I loved the idea of being Irish. To ten-year-old me that was way cooler. While I do feel roots from my mom’s paternal side, I feel closer to the French side of my family. My mother’s maternal side is about as French as it gets. My grandma, or “Mimi” as we call her, is second- generation French-American. Her parents were the first of each of their families to immigrate to America from the French island of Guadeloupe. My great-grandfather Jack Bunel, or “Papa Jack,” and my great-grandmother Annette Ligniere, or “Meme, were both born on the island.